A Somali journalist who helped al-Shabab kill five fellow reporters has been executed by firing squad. Hassan Hanafi, once a respected broadcaster, was sentenced to death last month by a military court in the capital, Mogadishu. He assisted the Islamist militant group by identifying possible targets amongst journalists between 2007 and 2011. He joined its armed wing after working for Radio Andalus, al-Shabab's mouthpiece in Somalia. More than 25 journalists have been murdered in Somalia since 2007, the Committee to Protect Journalists says. 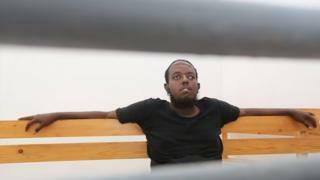 While he was working for al-Shabab, Hanafi would call up journalists and threaten them with death if they refused to join the militant group, the BBC Somali's Mohammud Ali says. Al-Shabab frequently stages attacks in Mogadishu and other cities, and still controls many rural areas in southern Somalia.